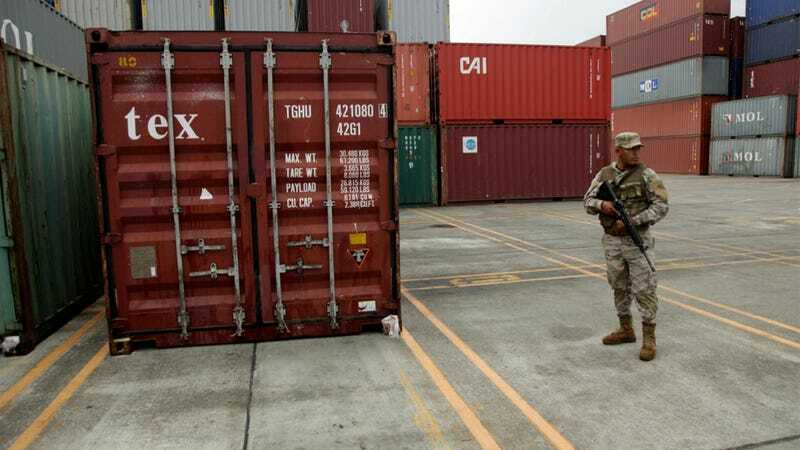 Investigators in Panama found all sorts of interesting goodies when they stopped a North Korean ship passing through the Panama Canal last week, including some sugar, cables, and electrical equipment. Oh, and two MiG-21 fighter jets. Seriously. Astute Planelops know that MiG-21s are hardly spring chickens. Reuters says the planes found onboard were produced by the Soviet Union way back in the late 1950s. A kind of AK-47 for the skies, the MiG-21 still remains in service for a number of countries. Despite their age, shipping MiGs through the Panama Canal — especially if you're North Korea — is super, super not okay. Panama has asked the U.N. to investigate the ship and its contents to see if North Korea is in violation of its nuclear and ballistic missile embargo. The ship's crew remains under arrest and charged with attempting to smuggle weapons through the canal. Hat tip to Automatch in Oppo-town! ...transport MiG fighter planes through the Panama Canal.